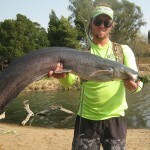 How To Fly Fish For Sharptooth Catfish (Barbel)? Barbel on fly are one of those challenging, but extremely rewarding, freshwater fish to catch on a fly fishing setup. 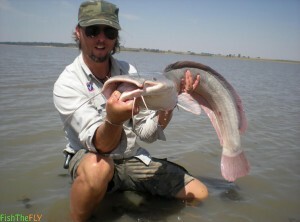 The Barbel is known as the Sharptooth Catfish (Clarias gariepinus), or the Baber in Afrikaans. It gets it’s name from the whiskers (Barbels) it has protruding from it’s mouth area. Catching Barbel on fly is fun and adrenaline pumping, and the techniques you use to catch these fish on fly are extremely exciting, as you will read below. The Barbel (Sharptooth Catfish) is found all over South Africa, and is similar in appearance to the Blunttooth Catfish, but the Barbel lacks the fleshy fin between the dorsal fin and tail that the Blunttooth Catfish possesses. The Barbel (Sharptooth Catfish can grow into a huge species… It can reach close to 2 meters in length and weigh up to 60 kilograms. The angling records (For the time being anyway), do not come close to the size that this fish gets. The Barbel comes in all sorts of different colours, depending on the environment in which they inhabit. They can be completely black, or a cream – nearly white – colour. The more beautiful specimens have olive green or brown blotches on them. The Barbel (Sharptooth Catfish) is a member of the air breathing catfish family, and can often be located when they are sipping air from the surface of the water. Essentially, Barbel on fly can be easy to target. When I say easy, I mean easy to find, not to catch. They are the most common and widespread fish species in South Africa. They can be found almost everywhere, from big rivers, to dams, to weirs and flooded marsh land. They are highly adaptable, and can move over moist land in order to reach water. 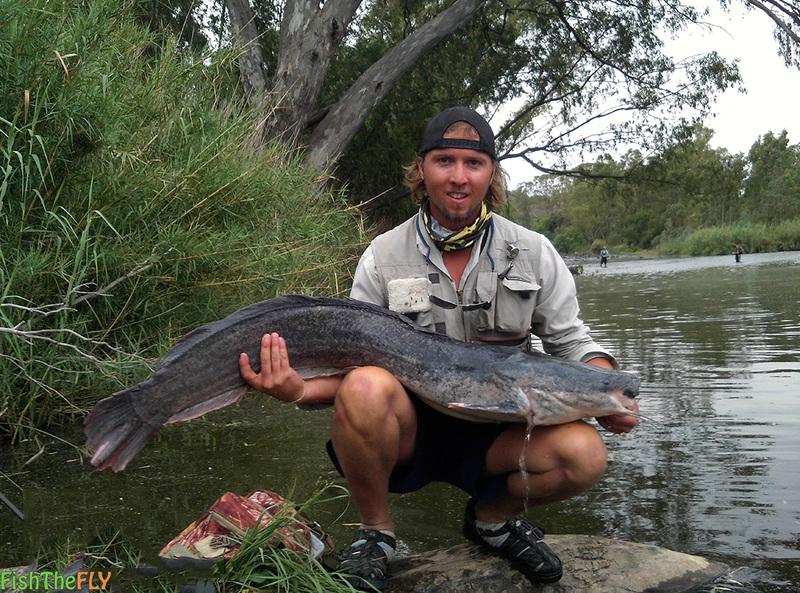 The Barbel (Sharptooth Catfish) were introduced into the Western and Eastern Cape, they never previously occurred here, but they have adapted and are thriving in these areas. The Barbel is an apex predator, which many people do not realise, and they are also a scavenger. They eat everything and anything that comes there way, as they are very opportunistic. From birds to frogs, to fish and snakes, to insects and rodents. You name it, if it is on range of the Sharptooth Catfish it will move swiftly in order to feed. They even eat plants, bird faeces and fruit. 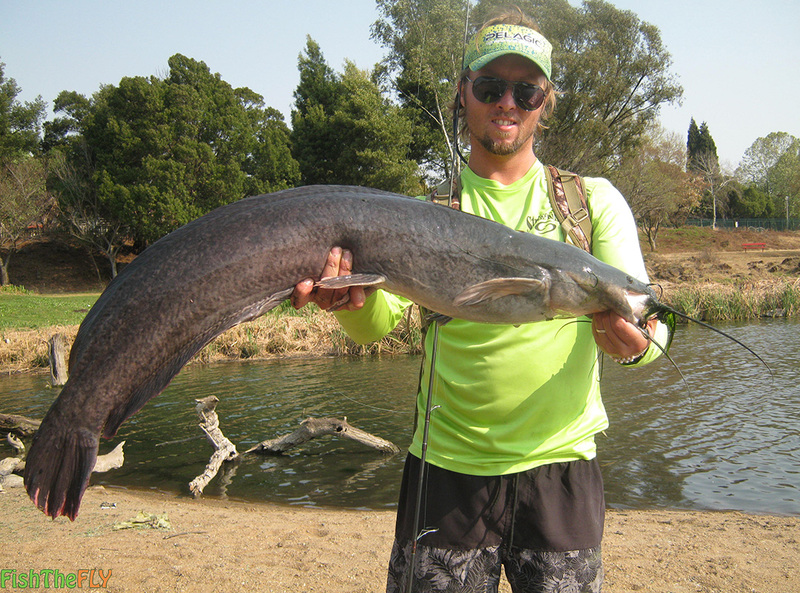 This is why they are the most widespread fish in South Africa, and why they are so common. Barbel can even filter feed on micro organisms and plankton when food is scarce. 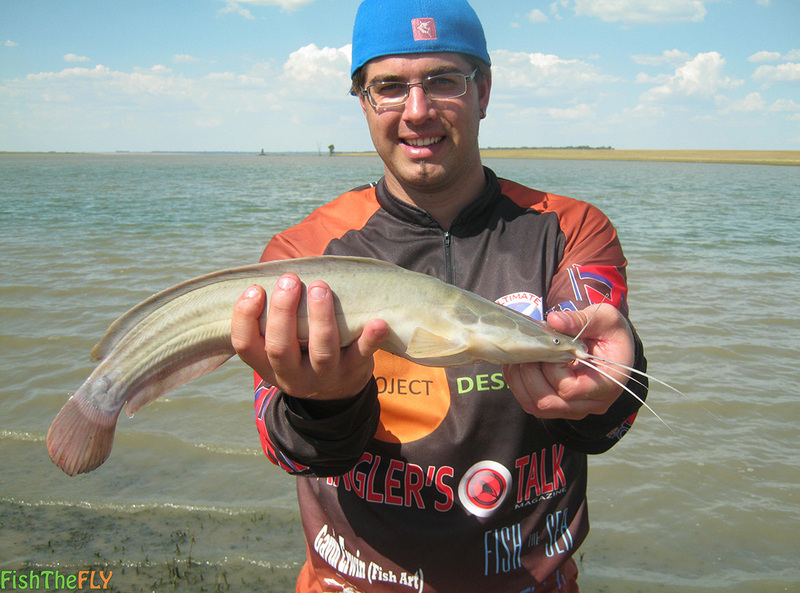 Without a doubt, the Barbel is the most adaptable fish species in South Africa, and is a true survivor. Barbel spawn and breed after the first Summer rains, where they congregate in shallow areas or floodplains. They can come together in their hundreds. The eggs laid hatch in 2 days, and in the first year (Depending on food availability) they can grow up to 30 centimeters in length. 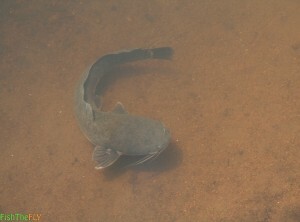 The male Barbel tend to grow a lot larger than the females. 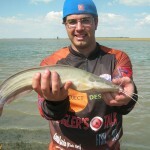 How To Fly Fish For Barbel On Fly? There are a variety of methods to catch Barbel on fly, but a few work a lot better than most. 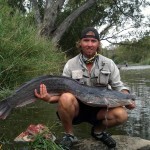 The key to fly fishing for Barbel (Sharptooth Catfish) is to locate them. You can locate them by looking for them on the surface. They can often be seen by their mouths and whiskers coming up to the surface. They are filter feeding, scavenging for larger food items or breathing air. You can also find them by looking for them in the shallows or watching out for them “finning” where their tails and fins come out of the water. You need a heavy fly fishing setup to target Barbel on fly. A 9 weight with floating line and at least 15lb tippet is a must. Barbel love noise in the water, which is why the calling method works so well. You use a heavy fly (The BBB is great here), and cast it 5 or 6 times on top of the Barbel and then let it sink. Repeat the process, and I am sure you will be happy with the results. Look for the Barbel in the shallows and use a big wet fly or streamer such as the Mrs Simpson or Fritz Bugger and pull the fly at different speeds past the Barbel (Sharptooth Catfish), until you get the fish to take it. They will often chase the fly down when they really want it. This is a new method that came from the Fish The Fly team testing out a popping method with a cork and lure, and this works very well. Attach a big Popper to your fly line with a trailing fly such as a Half Chicken or Carp Fritz about 40 centimeters behind the popper. Cast to the feeding fish, and give the popper a huge splash. Wait for 5 – 10 seconds and do it again. The Barbel often take the trailing fly without warning or notice, so hold on!